Greetings again from the darkness. I’ve noted many times how World War II has been mined for cinematic purposes over the years, even to this day. It’s always seemed a shame that World War I – ‘The Great War’ – has so few big screen projects in comparison. Obviously, timing is a major reason. World War II ended in 1945, which means during our lifetime, many of those veterans have been able to record their experiences and memories. In contrast, 2018 marks the 100 year mark of the end of World War I, so the archival footage and documentation is significantly reduced – and sadly, much of it lost or destroyed over time. Because of this, we should treasure this latest from director Peter Jackson as he allows these WWI participants to come alive and tell their stories. But it’s more than historical significance … it’s truly fascinating to hear the words from those that were there. Director Jackson is best known for his THE LORD OF THE RINGS and THE HOBBIT trilogies, as well as his version of KING KONG (2005) … all “large scale” movies with ground-breaking CGI effects. For his latest, he gets much more personal and intimate, though the technical achievements are equally impressive. The first thing to note is that this film is not presented as a historical timeline detailing the political motivations or battle strategy of the various countries involved. Instead, we hear archival audio from dozens of soldiers who fought, and we see actual video clips and photographs – many we’ve never seen before. Mr. Jackson’s grandfather was a soldier in WWI, and the film’s focus is on the experience of the British soldiers. Fittingly, the film begins with soldiers’ words playing over some of the faded and tattered war footage. These soldiers go unnamed as the goal is to have us understand the experience – what motivated them to enlist, and what it was like to serve on the battlefield. As we hear the words, the scale and clarity of the video transitions to full screen in vivid color … it’s breathtaking to see these figures become living, breathing, smiling young men from a century ago. The words of these men fill us in on aspects of the war that most history books gloss over. Many of them “exaggerated” their ages so they could join their friends or relatives in the war. We learn about ‘plum and apple’ jam, stew, sipping water from gas cans, and the challenges presented when the ‘poop pole’ gets overloaded. The trenches are seen up close as mazes of mud (when not fully flooded) with cutouts for sleeping and cooking. We see proof of trench foot/gangrene due to the impossibility of proper sanitation, and we hear and see the constant threats of green gas, snipers and artillery shelling – and that’s on top of the relentless smell of death and infusion of rats. This is about being a soldier … the ramifications of leaders deciding war is the best or only option. 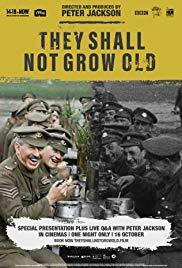 Director Jackson makes it personal, and a segment where the British soldiers mix with injured and captured German soldiers proves that these young men have more in common than not. They all just want to survive and go home to their loved ones. Jackson co-produced the film with his wife Fran Walsh, and with the involvement of the Imperial War Museum and BBC. Controversy surrounds the colorization of archival footage. I would encourage anyone who feels this way to understand this is much different than bastardizing IT’S A WONDERFUL LIFE or CASABLANCA, where those directors purposefully lit scenes and sets based on the black and white filming process. Jackson is dealing with war footage from100 years ago, much of it by war photographers or soldiers. The purpose is to cause the people and horrific settings to come alive for those who have never connected with WWI – preserving The Great War for personal and historical purposes. It’s really something to behold. This entry was posted on Monday, December 17th, 2018 at 8:36 pm and is filed under Documentary. You can follow any responses to this entry through the RSS 2.0 feed. You can leave a response, or trackback from your own site.